Multi-tiered patio with custom colored slate border. 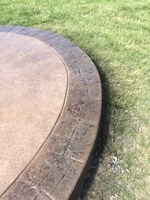 Unique patio design with an additional step down circular area that doubles as extra seating space during the day and portable fire-pit area at night. This terrace is connected by a walkway to the driveway with decorative bands that match the borders.